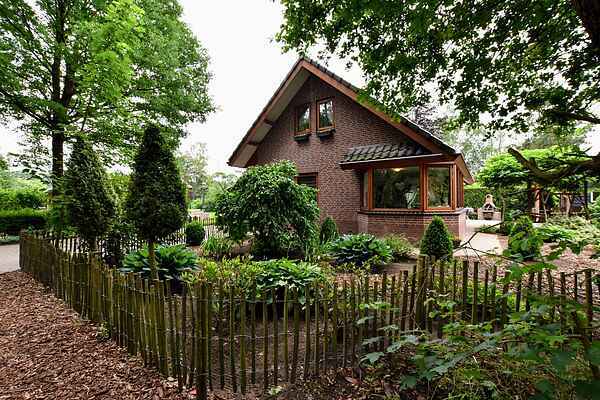 This beautiful detached holiday home offers plenty of space, and is located in the center of the Netherlands, on the edge of the Veluwe. The holiday home is on a main road. From the house you can easily walk into the woods right across. Children can enjoy themselves on the playground equipment in the garden. Would you like to be able to utterly relax during your holiday? You should be able to do that with a lovely hot bath in the holiday home. To really relax and enjoy yourself, you can use the private sauna and jacuzzi behind the house! The nearby village of Voorthuizen is also called 'the gate to the Veluwe.' Here lies the Zeumeren recreational area where you can waterski, play midget golf or participate in other outdoor activities. When the weather is good you can even go swimming. Go out and discover nature on the Veluwe by using the hiking and biking trails. Golf lovers can enjoy themselves in the Edda Huzid golf club, about 2.5 kilometers from the holiday home. Great places to visit are the Old Trades and Toys museum in Terschuur, the Corn Maze in Voorthuizen and Het Loo Palace. Countless trips to parks in the area are also possible. For instance, De Apenheul, Julianatoren, Amersfoort Zoo, Burger's Zoo in Arnhem or the Kröller Möller museum.